Spring is in the air, and with milder temps and melting snow we can look forward to some new beginnings and amenities that continue to add to the quality of life we enjoy in Greater Concord. Capitol Center for the Arts’ ongoing Bank of New Hampshire Stage construction project on the site of the long vacant Concord Theatre is in full swing and will open in June. Rumor has it that some of the shows under consideration are trending towards the very hip. I have a feeling this new flexible Main Street venue is really going to light the community on fire and bring more visitor energy to one of the coolest state capitals in the Northeast! We’re excited to share that Creative Concord, Kimball Jenkins School of Art, and local artist Karen Kelly are looking at a collaborative mural project for the city’s developing Heights neighborhood. Plans are in the early stages, so more on this in a few months. Speaking of art, Creative Concord in partnership with the City of Concord is once again recruiting more sculptors for the leased public art on Main Street. 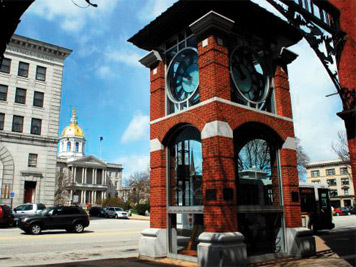 Expect to see some new pieces in downtown Concord this June—a call to artists is currently out. Award-winning sculptor Gillian Christy is shown above with her “Space Within” installation now on exhibit as part of Concord’s First Annual Outdoor Sculpture Exhibition. Have you been to downtown Penacook’s new, community-centered coffee shop yet? Kaye Place is located right on the main drag at 324 Village Street and is quickly becoming an important social gathering place where you can enjoy a latte, espresso and lots of other interesting treats while viewing some fine exhibits by local artists. We’re proud to welcome this much buzzed about business as a new member! Concord’s new White Park Skate House will be open before you know it. In the warmer months, the building will be available for meetings, social gatherings and receptions (we hear wedding bells!) and in the winter it will be a wonderful spot to take a break from skating and warm up at an outdoor fire with a hot chocolate. This new venue will be hopping at the 10th Annual Black Ice Pond Hockey Championships & Winter Festival from January 23 to 26, 2020—it looks to be a real gathering spot! 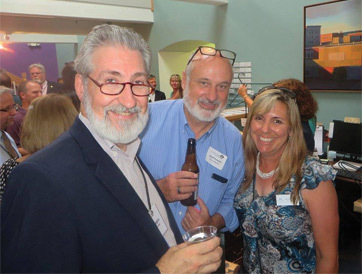 Outside of town, members are gearing up for another exciting season with many types of events throughout Greater Concord that feature something fun for everyone. We’re looking forward to the 18th Annual Pats Peak Mountain Bike Festival, Canterbury Shaker Village’s Artisan Festival, New Hampshire Fisher Cats Baseball games, the 20th Annual Mt. Kearsarge Indian Museum PowWow, the new Country Music Festival at New Hampshire Motor Speedway and lots of other great things to do with friends and family. Lately it seems we always have something to look forward to in the Capital region! Enjoy these longer days and the opportunity to shake off winter with others who share our interests, hobbies and neighborhoods.